I’ve known since the day I held my sweet blessings in my arms that there were things I wanted them to know deep in their bones. And, I knew in today’s world, it would be up to me to make sure they learned it. it’s about so much more than what the world tells you to be. Your heart is decorated with badges of brave and big, big dreams. And that, sweet girl, makes you sparkle. Your mind is a masterpiece with delicate detail like no one else’s. And that, sweet girl, makes you shine. Your spirit is adorned with love and goodness. And that, sweet girl, makes you glow. Your eyes shine bright with the kind of happy that can’t be contained. And that, sweet girl, makes you shimmer. Your voice is bold, full of truth in who you are. And that, sweet girl makes you dazzle. that you are, in fact, more beautiful than you know. you’ll always be stunning from head to toe. because you, my sweet girl, are more than what the world tells you to be. You Are More Beautiful than You Know was born shortly after my second child – a baby girl. Before her, I would tuck my son in every night, then sneak back into his room just before I went to bed. I’d hold his little hand and pray my heart out for him. I had the same checklist that I went through each night – mostly asking for help in not screwing this piece of perfection up and that his daddy and I could keep him just one more day. There’s next to nothing that breaks my heart more than the thought of my daughter ever believing she’s not beautiful. The possibility of her not seeing herself the way I do. The way her daddy does. The way God does. 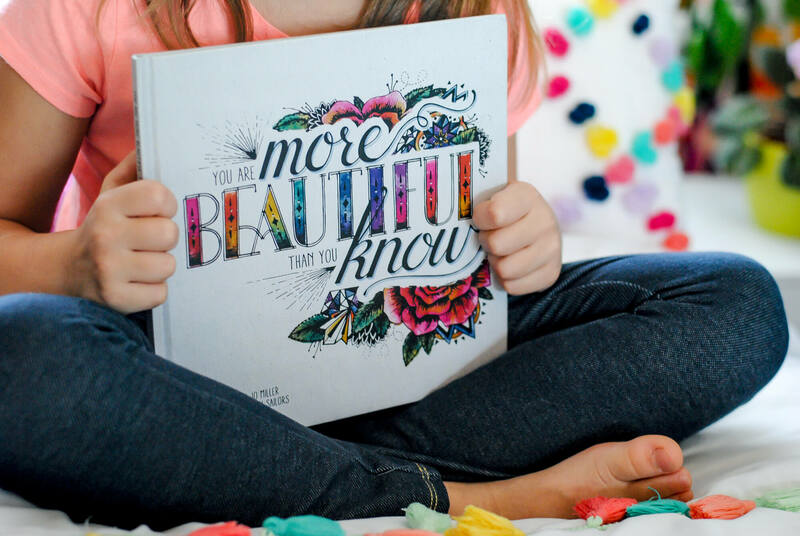 Every little girl – and the woman she becomes – deserves to have a seed of confidence planted inside of her that blooms into knowing, I am beautiful. I am enough. I am proud of me. At that point I had the story. I had the inspiration. I had the words. I just needed to make them beautiful. I sent an “out of left field” text to an old friend from college who I had been keeping up with in the social media realm, but hadn’t talked to in real life for a handful of years. She’s VP of Creative at an agency in Nebraska and cofounder of adaesthetic.com; she creates things so dazzling and lovely and all things good, it’s beyond my ability to put into words; and possibly most importantly, she has two daughters of her own. I dished my idea, shared my story, and waited with more anticipation than Christmas Eve for her answer…so what do you think it would cost me to have you illustrate something like this? Because seriously, her work, as you’ll see – priceless. Her answer was like the stars aligning. “What if we went in on this together instead?” YAS! She got it. She totally understood my heart, and was willing to put hers on the line as well! 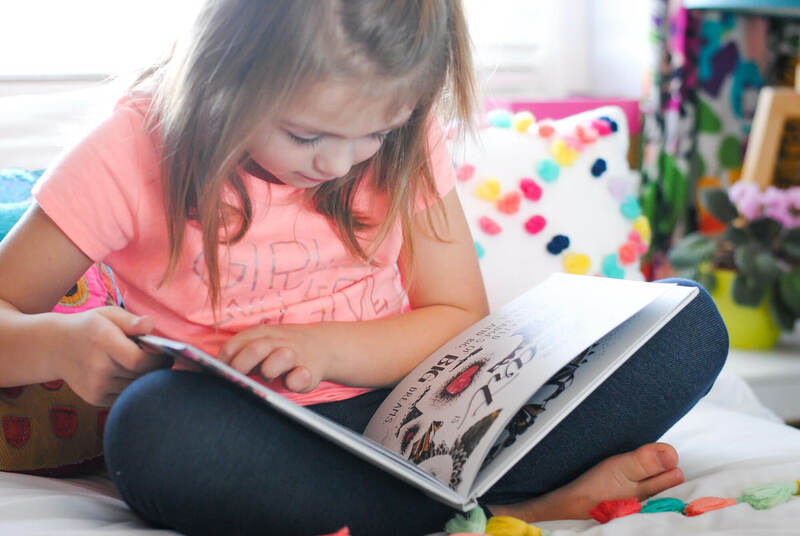 So here we are, with all of our love and momma souls poured out into these pages, and we can’t wait to become a bedtime story for your daughter, gift for your sister, inspiration for your graduate, encouragement for your wife, or anything else you can dream up!